When you first take a look at the Mega Joker slot game you may assume at first that it is just a standard 3 reel 5 pay line slot. However, it’s much more than that, and it will have no difficulty keeping you entertained. 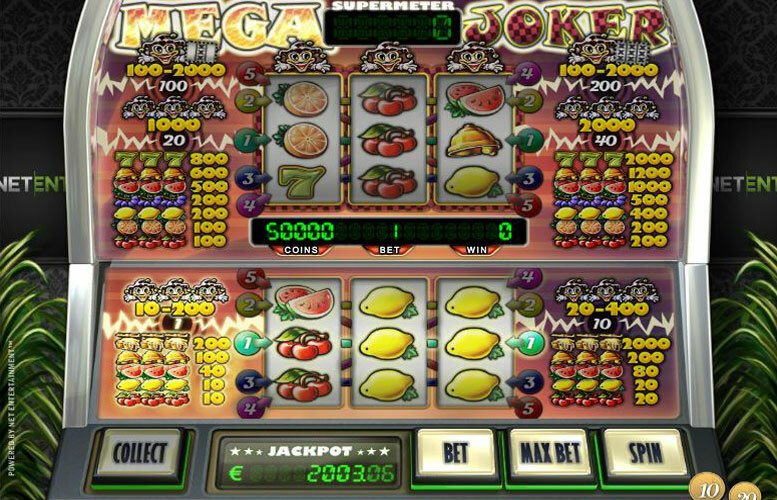 The whole theme is based around fruit, and if in the past you have not been much of a fruit lover that could soon come to an end if you happen to win the 2,000 coins jackpot by getting 3 jokers in the supermeter mode, or the random payout jackpot. You may think that you will be missing the many features and bonus games that come with modern multi-line video slots, but that is not not the case because of the unique way that Mega Joker is played. This game is comprised of a regular or basic mode of playing, but also a supermeter mode, and of course the random jackpot which by the way is a progressive jackpot. To begin with if you want to know just how much the current jackpot is while you are playing the game you simply have to look at your machine and its displayed right there in the bottom left next to the ‘Bet’ and ‘Collect’ buttons. You could suddenly take a spin, line the Joker symbols up on the paylines, and bang you are awarded the Progressive jackpot but this will only be possible if you are making the max bet. To win the 2,000 coin regular jackpot you must enter the Supermeter mode with a 100 or 200 coin win and get lucky by spinning in the bar symbols. If you’ve never played a slot machine with Supermeter Mode before then don’t worry it’s not difficult to understand. It’s essentially the same as gambling your win. Any win you collect from spinning the regular reels will be added to the Supermeter meter at the top of the screen once won. From here you can then choose to spin again and try to spin up your winnings to an even bigger payout or just collect the winnings you already have using the collect button. The choice is yours but the biggest prizes are for those willing to take the risk in Supermeter mode. The joker – if you get 3 in basic mode will pay out 400 coins, and in super mode the payout is 2,000. The 3 bells in basic mode will pay out 200 coins and 1,200 in super mode. Get 3 watermelons in basic mode and you only get 80 coins, but get them in super mode and you will receive 800. 3 lemons in basic mode will only give you 20 coins but will pay out 200 in super mode. The cherries in basic mode only pay out 20 coins but land them in super mode and you will get 200. The 3 7’s are only available in super mode and will pay out 2,000 coins. Although you don’t have all the additional features and bonus games that a lot of the multi-line slots come with you do have the skill stop feature. This is where if you feel that you can second guess where the wheels are going to land you can hit the spin button and stop the spin before it completes its cycle. Also if you are one of these individuals who things that changing their playing style also chances their luck then you can try out the autoplay. This means if you hit the autoplay button it will automatically generate the spins without you have to hit the spin button each and every time. The betting limits on the Mega Joker slots machine are about as simple as they get. You either play for a coin value of 0.10 or 0.20 and this is changed by using the coin symbols in the bottom right of your screen. This means the cost per spin, if playing in UK pounds, is either £1 or £2. This game has a rating of 4 / 5 with 181 total reviews by the users.